I’ve written before about how this year will be one where I spend some time in other locales for the good of my writing (see “My Hemingway Summer” — an earlier post on this blog). When I travel even short distances for writing purposes, my brain begins making observations and connections that it typically doesn’t make during my everyday routine. For example, during residencies for University of Tampa’s MFA program, I would find deeper significance in even the tiniest of details around me. A pile of bricks I passed daily on my way to workshop became a poem. The creak in the stairs of Plant Hall wound up documented in another piece. Every minute detail seemed to come alive with literary potential. 1.) Small pocket notebook with cheap ballpoint pen: I stole this idea from one of my mentors, Peter Meinke. He has always advised poets young and old to carry something with them to record inspirations. First lines, striking images, and clever turns of phrase are just a few of the things I find myself scribbling into my small pocket notebook, and that happens more frequently when I travel. 2.) White, college-ruled legal pad and good fountain pen: When the inspiration strikes and the ideas are flowing into developed, coherent stanzas, this set of tools becomes my go-to. Whether I’m at a hotel room desk, a coffee shop, or in the middle of the woods, the old standby of writing by hand on a good, stiff pad remains an important part of my creative process. I may have mentioned it a time or two previously, but for fountain pens, I prefer Waterman Phileas models. A good ink in a unique color also helps — see Levenger. 3.) The latest copy of Poets and Writers magazine: When the muse has cooled and I’m thinking about more logistical matters (where to submit, what contests to enter, etc. ), I like to peruse the pages of P&W. Their interviews are excellent, their prompts timely, and their resources consistently useful. Maybe it’s a Luddite reflex to prefer the paper copy of the magazine to the digital version, but it’s nice to be able to annotate, highlight, and even tear out pages when needed. 4.) A traveling library of a few essentials: There are some poets whose work manages to inspire me again and again: Robert Wrigley, Rodney Jones, Claudia Emerson, Maurice Manning, Kevin Young, and C.D. Wright, to name just a few. I usually pack a few volumes of poetry I admire to look over when I’m between sessions. Sometimes I read them for leisure, and other times I’m performing serious critical analysis. Either way, they work their magic. 5.) Technology? Well, maybe just a little… Before anyone gets the idea that I scribble monastically on parchment with a quill, let me say that I like my tablet-laptop combo as much as the next guy. But I try to steer clear of the screen as much as possible when traveling for writing purposes. Only when I’m truly ready to create a final draft of something or when I feel that courtesy dictates I should check email do I return to the glowing square of distraction. In the evenings when there’s time, I might post a few social media updates just to keep friends happy. But the whole notion of getting away is, well, getting away. I don’t even use the same brand of soap I do at home when I’m on the road. I want a complete contrast with my normal life. Toward this end, I also abandon unnecessary technology use. It cuts down on procrastination, and it lets me see the world around me more organically. So, there you have it. Five things (or groups of things) I tend to carry with me on writing adventures. I’d be interested to hear in the comments what items you just can’t live without when you attend a retreat, conference, workshop, or seminar. Do you prefer a particular brand of coffee? Is there a doodad or whatnot you superstitiously pack? Whatever it is, I wish you great travels and great writing in the future. Here’s hoping for a highway full of words to fill our pages. My sons and I catch a lot of bass. There’s a pond behind our home where we catch them (sometimes over and over again) and then release them. We’ve used lures, live bait, and a whole host of other options. We’ve also caught fish in all four seasons. When the cold weather comes, we just fish deeper to reach the warmer waters where these freshwater species tend to hang out. Welcome to Florida. But one thing I’ve noticed is true for both poetry writing and bass fishing: The moment you stop trying so hard is the minute success visits. It never fails — if I’m “concentrating” on reeling in a monstrous fish, my line will stay slack for hours at a time. When I’m lost in a daydream about something totally unrelated to fishing, however, suddenly I’ve got more bites and tugs than I could ask for. The same is true for poetic inspiration; if I’m trying to “force it” too much (or be too “literary”), you can bet that future poems will stay safely in the cattails of my mind, away from any lure I may be jiggling to get them to emerge. But if I just go about my ordinary day-to-day tasks, epiphanies will come. This observation is common among writers I know. When they go to literary retreats, workshops, conferences, and similar venues, they find themselves lacking inspiration, partially because they’re looking for it too hard. Only when we allow ourselves to relax, wander, and flow will we be visited by first lines or great ideas. There’s plenty of research to back this up too: Daniel Pink and other scholars have long known that creativity is maximized by mental ease and comfort rather than stress. So, what’s the message? In writing as in fishing, let the good things come to you. The biggest bass and the most impressive poems tend to surface when we kick back, watch the clouds, and allow nature to take its course. I haven’t fought any bulls or driven any ambulances overseas, and surprisingly enough, even though I reside in the Sunshine State, I have never landed a giant blue marlin (or any other large saltwater fish, for that matter). However, once in a great while, I encounter an opportunity that combines Hemingway’s two great loves: travel (usually in natural settings) and writing. Such was the case in 2016, when I spent 16 days in Lisbon, Portugal. From the food to the language to the music to the memorable landmarks, that city and its surrounding areas made me feel like the reincarnation of some Lost Generation member — enjoying the days and nights in a European setting, chatting casually about artistic concerns with like-minded others. Even now, certain Lisboan influences still enter my work from time to time. And this summer presents a similar (though more domestic) opportunity. For one week in early summer, I will be attending a writer’s retreat in the Cumberland Gap area of Tennessee. The natural splendor of the area combined with solitude should produce some favorable results. My plan is to work on poetry for half the week and prose for the other half, but we’ll see what the muses have in mind. I have two manuscripts in the works, and there’s no telling where creative isolation may lead. But whether I’m reeling in the big one or attempting to pen a masterpiece, I am hopeful that the spirit of Hemingway — the spirit that seizes the world by its lapels — will work its magic. And I hope that you too, reader, will find joy and inspiration as warmer months finally arrive. To good times and good writing: Cheers! Recently, I attended a lecture by a respected writer who posited that we should write about the obscene, the vulgar, the disgusting, and the revolting. He said that his logic for this encouragement depended not upon shock value, but rather, upon the notion that all such things were true. Specifically, he called writers in the seminar to write about their bodily functions, sexual encounters, hidden diseases, and sources of physical shame. This, he said, would lead to writing that was absolute truth, and would liberate writers from their self-consciousness. Likewise, such writing would reach an audience that has apparently been searching for such literature — in his mind, there exists a group of people who want to know that others do, in fact, excrete waste, cavort recklessly, and wrestle with modern-day plagues (and desire to read about it). Perhaps so. As the leaders of all other species, and as cognitive, reflective, intellectually astute creatures, we should use our creative and mental faculties in the most supreme way possible. Keats was not wrong when he equated truth with beauty, even though his definition may have been an oversimplification. Yes, there is more to truth than just beauty, but as highly developed beings, we should seek the best and finest truths rather than those which debase or denigrate. St. Augustine, Martin Luther, and countless others (including the Romantics) have reached this conclusion well before our time. To write about subjects primitive, desperate, and scatological can sometimes be a fun and bawdy diversion, but devoting oneself to these lesser ideas renders literature into the equivalent of monkey-flung feces, to borrow an image from the aforementioned speaker. Some will call this assertion elitism, and maybe it is. But if we are to leave a legacy of thought, shouldn’t we aspire to greatness rather than the sewer? Shouldn’t we leave behind something more than our literal behind? All this theoretical explication probably won’t change the downward spiral of gutter-dwelling “literature” that is being written. I get that. But if one person lifts clearer eyes to consider things less coarse, less brutal, and less detestable, then this small epistle hasn’t been in vain. As writers, we don’t have to be Pollyanna, falsely portraying a world that is all sunshine and daisies; in fact, we have an obligation not to. But likewise, we don’t have to decrease our own personal and cultural worth by slinging words that glorify the gross and reprehensible. We are more than organisms.We are wonderfully made, and that wonder should shine in all we write. Only by climbing to the top of my grandparents’ magnolia could I see it: Far off in the west, craning above a humdrum horizon of pines and oaks, there was what I called “The China Tree.” In retrospect, it was probably just an oddly-shaped cypress, but its shadow pressed against sunsets made me think of Oriental landscapes and scenes from books and paintings I’d encountered as a boy. While still a child, I vowed to seek the tree one day — I’d strike out on a hike to find its magnificent shape beyond the neighbors’ fields, and rest only once I’d stood at its proud, ancient trunk. The tree was a conquest-in-waiting, a thing of distinct beauty and history beckoning above and well beyond all that was common. And I told myself I would be its discoverer. From my favorite thinking spot, the barn roof, I couldn’t see the tree’s paisley canopy; there were too many power lines and old chimneys blocking the view. But from the barn’s apex, I could ask myself: How will you know when you’ve found it? My answer as an adolescent was full of hubris — I’ll just know. Something that big, something that rare can’t be easily mistaken. When I last returned to my grandparents’ farm, my boys and I climbed the old magnolia again, and I noticed that the China Tree was gone. Taken by hurricanes or hungry chainsaws sometime during my adult absence, its silhouette no longer marked the horizon. It saddened me, as I never pursued that quest I’d promised myself, and moreover, my sons would never know that landmark. Maybe, though, in a more figurative way, I’ve been on the China Tree journey my whole life: I wanted to seek it for its beauty, its history, and its difference from everything around it. Is that not what the life of a poet is? As one who has chosen the unconventional path toward a goal that many don’t understand, I believe that even today, I am seeking the China Tree. Yes, now it is more symbolic than literal, and maybe it’s a little harder to see — after all, the pines and oaks of grown-up obligations tower thick and high, and some days, it’s tough to discern my target. Yet the ultimate objective remains the same: Find beauty, find history, find originality. With these missions in mind, I renew myself to the path ahead of me. The China Tree has not yet been fully discovered, and I will stop only once I can rest at its majestic foot. Time to press onward. Earlier this year, brilliant mathematician and Nobel Prize winner John Nash and his wife Alicia were killed in a car wreck. Nash’s work and life were the subject of the film A Beautiful Mind, directed by Ron Howard in the early 2000s. Like many moviegoers, I too was touched and inspired by Nash’s biography (even if it was “adapted” for film). His humble West Virginia origins, his battle with personal demons, and his eventual rise to academic and economic prominence spoke to audiences everywhere. Martin Hansen, played by Josh Lucas in the foreground, engages in some party snobbery toward John Nash (Russell Crowe), at left. 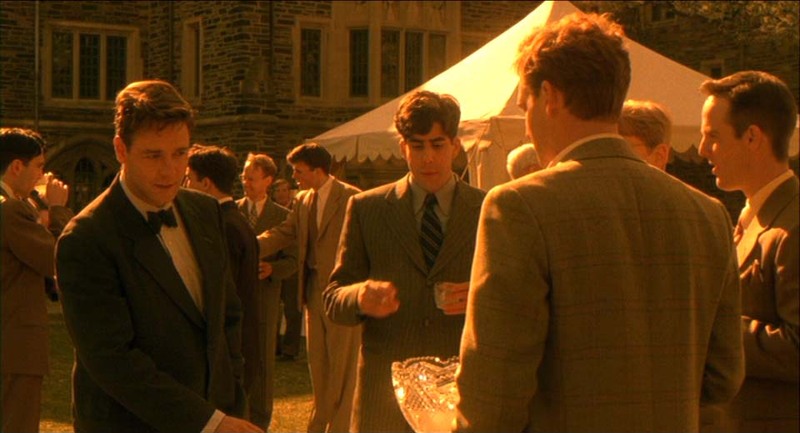 Recently, one scene from Howard’s movie replayed in my head as I encountered a situation similar to one faced by Nash early on in the film: Upon his arrival at Princeton after receiving a substantial scholarship, Nash is confronted by Martin Hansen during a reception. Hansen indicates that he “simply assumed [Nash was] the waiter,” due to his appearance. This barbed condescension is a hallmark of the early Nash-Hansen competitive relationship as portrayed in the film. People from small towns or rural upbringings often face this kind of slight, even today. I grew up in a town of 3,500 people. Everyone knew everyone else, and the main vocation was agriculture. So, when I eventually moved to a city of 35,000 people (and growing), I felt as though I’d made my home in a more metropolitan area. Even though the culture here is still one of welcoming and warmth (see prior posts), my city has many markers of being a larger, slightly more urban place than many of Florida’s smaller map dots. While I was serving as a guest lecturer at an area university some months ago, a student I met had the audacity to insinuate that small to mid-sized cities are undeserving of artists in residence or poets laureate. His contention was that only large cities and crowded urban areas should pay attention to literary and arts-related matters, because, after all, creative gifts can only thrive in such a vast and populous setting. There was more “talent” to choose from, he indicated, and more educated people inhabiting the big cities. So, let me set the record straight, if only to repudiate this student’s erroneous assumptions. Many highly educated and erudite individuals choose to be country-dwellers, suburbanites, and big city expatriates (I’d supply a list, but it would be far too long). Their decision is made not because they desire to be “bigger fish in smaller ponds,” but because they desire a truer sense of community, a safe and clean place to raise a family, or maybe because they hold dear the virtues that modestly populated areas often embrace. In the end, there are several reasons to eschew the hustle and bustle of the sky-scraped city, especially if one is an artist. Certainly, there are benefits to larger metropolises, just as there are drawbacks. And yes, arts and culture do thrive there in most cases. However, assuming ignorance or lack of refinement exists solely in smaller towns or mid-sized cities is the height of arrogant urban imperialism. I believe that Annie Dillard, Mark Twain, and John Nash would agree, for starters. And for me, smaller places yield bigger ideas. It is not by accident that Richard Hugo encouraged poets to seek out “triggering towns” that seemed to be more tight-knit communities. I’m not attempting to prescribe small-town living to those accustomed to bigger cities, nor am I advocating one particular mode of residency. But I do know that, for my creative purposes, small and medium places work. Those who denigrate them, somewhat ironically, need only a broader mind. 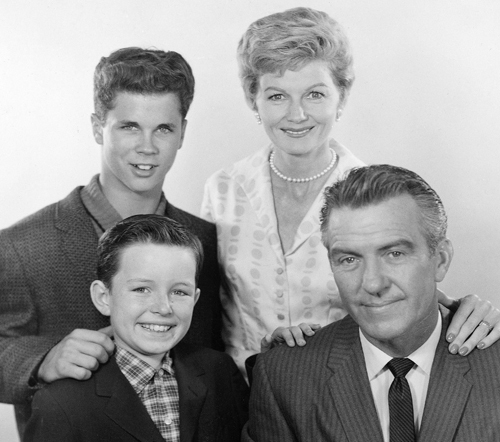 As a kid growing up in the 80s, my television family was the Seavers, not the Cleavers. Every boy my age wanted to be Kirk Cameron (Mike Seaver of Growing Pains), or maybe Michael J. Fox, who played Alex P. Keaton in Family Ties. Shows like these made it seem cool to be like those families and their kids, for certain. In today’s literary community, aspiring toward a more traditional type of success has been replaced by a phobia about being “too mainstream.” I was reading an article just the other day by a respected author who lamented that her life was “becoming too mainstream,” which she defined by tasks like going to the grocery store, washing dishes, and tending to the relationships beneath her roof. Sadly, being responsible and attempting to live a reasonable, self-sufficient life are both ideas that have been denigrated by various media in recent years. The notions that we should work ethically, raise a family, seek advancement in a single field, and aspire toward something greater than self-satisfaction are frowned upon by a vocal minority. There are those, after all, who believe such ideas to be too old-fashioned, too whitebread, or too puritanical for the twenty-first century. But this isn’t a political post. I’m here to defend the value of the mainstream in our literature, specifically. There is beauty in the common, after all, and while socio-cultural activists may be trying their hardest to redefine what constitutes “the norm,” Joe and Jane Average still know that their lives — complete with light bills, plumbing repairs, and runny noses — have wonder, merit, and poetry in their seemingly mundane routines. Eschewing the everyday limits the scope and reach of our literature. What’s more, by omitting mainstream details, artists portray a fallacious picture of what our world is really like: Rather than giving readers honest visions of life, many are seeking shock value, or perhaps some abstract, inauthentic version of their environment. In the end, both of these motives generate lies — creative, occasionally beautiful lies, perhaps, but lies nonetheless. While I’m no Realist (artistically speaking), I also don’t believe that writers should fear the mainstream. Give us the sidewalk cracks, the wasps and overdue notices in the mailbox, the wiffle ball stuck in the backyard oak tree. There is poetry in all these things, and there is life. Being mainstream, by the way, isn’t all that bad, you’ll find. Parenthood and the obligations of marriage, career, and family life remain sources of great inspiration, just as they did in prior generations. Maybe it’s not new, it’s not avant-garde, and it’s not the “artist thing to do.” But I’ll take it any day over the exotic or the crazy. To be clear, I’m not saying “mainstreaming” is for everyone. However, I am saying that in going about the business of writing, we as authors should not be scared of that which seems standard. For it is the run-of-the-mill that yields the exceptional, the original, and the special. And that, writers, is what we’re after — the diamond in the rough, the pearl inside the oyster, and the rainbow out of the gray. Without the ordinary, there can be no extraordinary.